The design is from Thai Crystal Magazine. - Swarovski Pearl 6 mm. or Swarovski Round Crystal 6 mm. Here I used watch clasp. I got it from the local store here. Cut nylon thread around 150 - 170 cm. String it from the back of the clasp. Add one crystal and one seed bead to each thread and cross the threads at a pearl (red arrow). Add one seed bead, one crystal and one seed bead to each thread. Cross both thread at a pearl (red arrow). Repeat step 2 all the way to your desired length. Connect the bracelet to the other side of clasp. I always string the threads back and forth two or three times to tighten the bracelet and the clasp. Now we string the threads back to the pearl (red arrow). String the threads to the seed beads (red arrows). Add one crystal, one seed bead and one crystal to each thread. Put the thread into the seed bead (red arrows). Cross the threads at a pearl (blue arrow). Repeat step 6 and 7 until the end. Again at the clasp, you can string the threads back and forth to tighten the bracelet and the clasp. I also made this bracelet by using Swarovski round crystal instead of pearl. Thank you. This one is really easy! I must try this. Thanks for the tutorial. Thank you. It is fantastic! Very nice! Where did you get those wonderful ideas? Thanks for sharing again! Now, I'm lack of creativity to make my own design. So I follow the patterns from Thai and Japanese magazines I have. This bracelet is from Thai Crystal magazine. Very lovely. I made it and I also fell in love with it. Haha! Another wow! 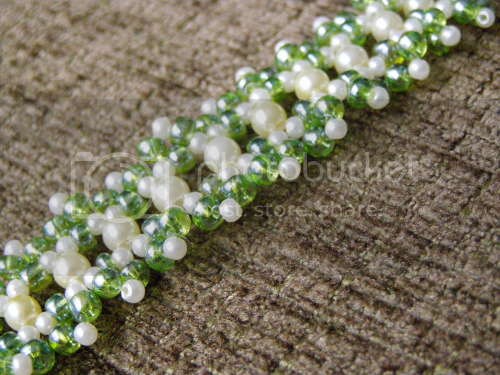 The bracelet is simple and magnificent and so is the tutorial. Iam in awww with all your tutorial you make beautiful jewelry, I cant wait to get started all this bracelet..thanks for all your hard work. It's very beautiful! Yes, the round blue ones are very lovely. I like it too. You mix and match your beads so well and it turns out very beautifully. Do you have any idea as to the name of the company who made the heart-shaped clasp you used or where it might be available in the US? I have looked for it but cannot find anything like it. Your work is really beautiful!! Thank you so much for your help. I went to Pandahall and also found the clasp. I am not sure I need 100 of them (since that is the way they ship them), but I have a good friend who is Thai and he owns a bead shop called Colorstones in Ft. Walton Beach, Florida near where I live and I will ask him if he may also know of another source for them. I have been to Thailand many times (the first time was in 1973), and Bangkok is one of my favorite cities in the world. The last time we were there was in 2004, so it is time to go back. oh sorry, i did not know they only sell wholesale. I only know them from the advertisement in bead magazine. lol I believe your friend can find the clasp for you. The shop I bought the clasp is called Rainbow Art at china town. Is it size 11 seed beads that are used in this deign? They are not listed in the materials list. Love the bracelet but when listing supplies, please include amount needed of each; like 40 pearls, 30 green bicones etc. would be extremely helpful! Thanks for the most beautifull bracelet pattern, i hope the political problem is sorted out and did not harm you or your family. I will still pray for you. Instead of using Nylon Thread/Elastic why not use a higher gauge wire like of 30 or 32 gauge anti tarnish colored wire.I feel it would last longer & not break as easily.Just a suggestion. I don't think you can substitute wire for thread in all cases. Wire is hard to hand weave and your bracelet will be very stiff. This design is very flexible, you can roll your bracelet. I'm not expert in wirework and I'm not sure you can use flexible wire to weave this design. But if you don't like the thread I suggest, you can use any thread you prefer. Actually, the thread I used here was monofilament thread. This was the only thread I used in my early years of beading before I introduced myself to nymo and fireline which I had to import to my country. I did not update the info in all my tutorials that it was monofilament.